Every dog has a history. No dog arrived on the planet fully formed in his Bulldog, Poodle or Cocker Spaniel self. They were each developed with the foundation of breeds that came before them. People required certain qualities of their pets and working companions. They would breed the dogs with the qualities they desired until eventually a new breed came into being. The dear American Eskimo dog has an interesting story He is believed to be descended from the white Italian Spitz, the German Spitz, Keeshond and Pomeranian. The Keeshund originally came in a variety of colours but eventually only grey was accepted leaving the white as not the breed standard. Leaving the white Keeshunds as undesireable. The white Pomeranian breed standard became 8 pounds or less leaving behind the larger Poms. It is believed these dogs were still kept as pets and found their way to the circus as performers. Dog was bred to dog with the most desirable performing qualities. Eventually they made their way to the US and an American name was given to them. Now this sturdy dog is known for his performing and agility abilities. 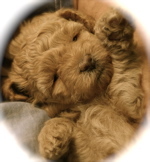 As the beginning of the labradoodle is very recent we have more precise information about the day it all started. In Australia, Wally Conron was puppy breeding manager of of Royal Guide Dogs. This organization sent guide dogs for the blind all over the world. A woman in Hawaii required a guide dog but her husband was allergic to dogs. Apparently they sent samples of Poodle hair and saliva to the lady’s husband but the allergic reaction persisted. Mr. Conron decided to try crossing a Labrador Retriever guiding dog with a Standard Poodle. They had a litter of three and only the hair and saliva of Sultan, the white puppy did not produce an adverse reaction. The other two puppies went on to have successful careers one as a Remedial Dog and the other as a Guide Dog. Puppy guide dogs are raised by guardian families and there was alway a lot of people willing to take on this task. However Mr. Conron found nobody wanted to socialize the new ‘cross breed’ dog. Mr. Conron was not a quitter. He went to a TV station in Melbourne and suggested they do a story about the new breed of guide dog. He need to call the dog something and came up with the name Labradoodle. There were 31 puppies bred in that initial program and of them 29 became successful guide dogs. It was not long before people were lined up to take one of these puppies and asking where they could find a Labradoodle puppy for their own pet. They found that the allergy friendly coat was great thing but also that the Labradoodle had a friendly personality and brought joy everywhere he went. 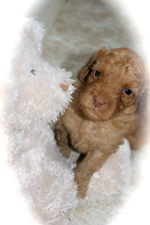 Lilyanna, minutes after her last Australian Labradoodle baby was born. Lylyanna and her mate were from stock originating in Australia. The first other breeder was a vet in Condoblin New South Wales. 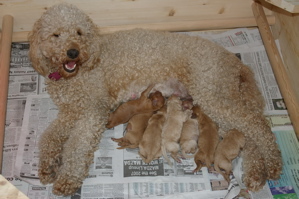 She bred miniature first cross Labradoodles very successfully. Soon two breeding and research centres were established in the state of Victoria. 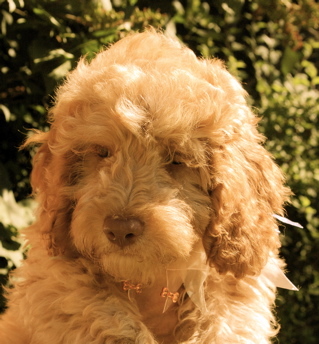 They began to breed Labradoodle to Labradoodle. Their original breeding stock came from another Australian breeder Don Evans in Northern Victoria. Many dogs that came to North America in the beginning of this century were dogs from these two research centres, Tegan Park and Rutland Manor. 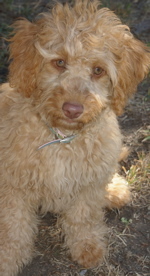 They did much experimentation and introduced other breeds into the foundation before they had the wonderful Australian Labradoodle we know today. Because of their huge success everybody began breeding lab and poodle crosses and calling them Labradoodles. Many were not health tested and like the two out of three puppies in that first litter not allergy friendly. The first association dedicated to the furthering and protection of this wonderful new breed was the Australian Labradoodle Association. 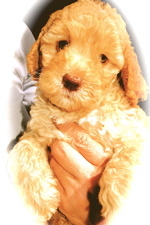 The International American Labradoodle Association is a sister of that organization. Member breeders carry on their breeding programs under the very watchful eye of this body. Health testing regulations and codes of ethics are very carefully watched. The goal is to have a breed of animals that retain the joyful disposition and work ethic of that original guide dog while breeding out hip dysplasia and other ailments that plagued the Poodle and Labrador Retriever. Labradoodle History Information from an article published by the International Labradoodle Association. An Explosion of Doodles. In A Reader’s Digest Article Mr. Conron expressed concerns. I began to worry, too, about backyard breeders producing supposedly “allergy-free” dogs for profit. Already, one man claimed to be the first to breed a poodle- Rottweiler cross!